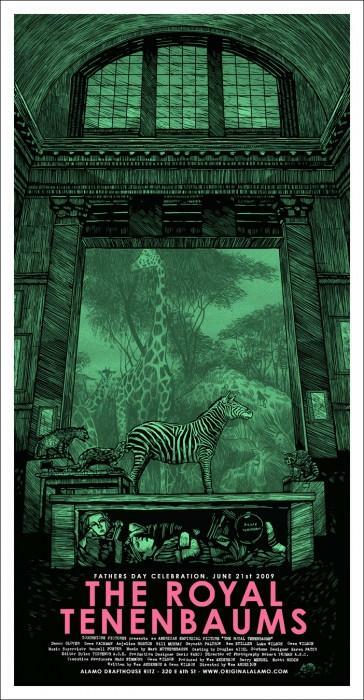 Welcome to the fifth entry in this ten part Top 100 Mondo Prints. Make sure to check out the posts covering entries 100-91 and 90-81 and 80-71 and 70-61 and 60-51 and 50-41 and 40-31 and 30-21 and 20-11 and 10-1. 60. The third entry in the Nightmare on Elm Street series is one of the more creative entries. 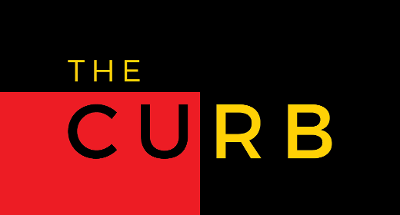 It places the lead character Kristen in a psychiatric hospital after fears that she’s suicidal – but really, it’s Freddy tinkering with her mind as she sleeps. Freddy arrives in the hospital with her where he wreaks havoc on the mentally ill. One such character – Taryn – is a drug addict seeking help. 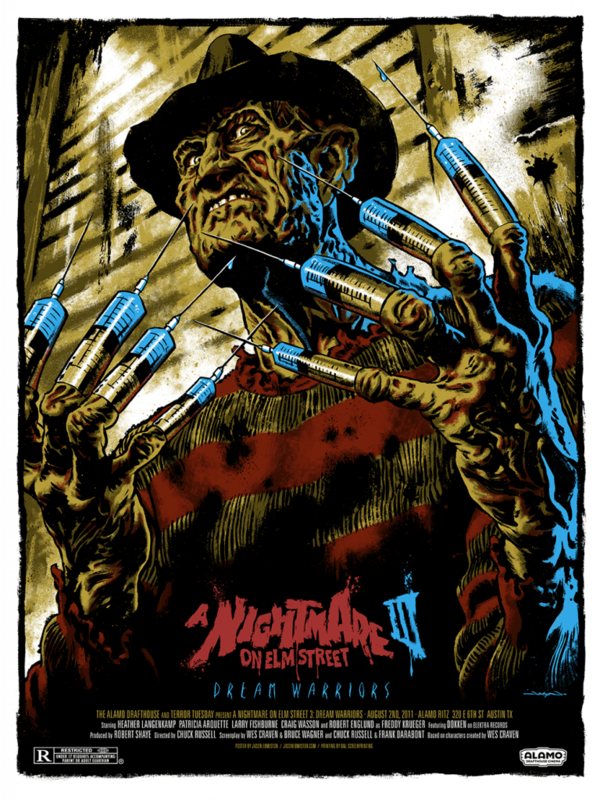 Her fate is sealed when Freddy transforms his blade covered glove into a hand of syringes, subsequently injecting her with amphetamines. Jason Edmiston’s print is terrifying. Freddy stares at the viewer of the print with pure menace in his eyes. Yet, behind that menace you can still see the glee that Robert Englund brought to the character as he took another young soul. The character of Freddy is one to fear, and here he is a figure of terror rather than being a comical villain that many may remember him to be. 59. Just like Jay Shaw’s Don’t Go Out Tonight series, Olly Moss delivered a powerful series of prints that utilised a minimised colour palette. 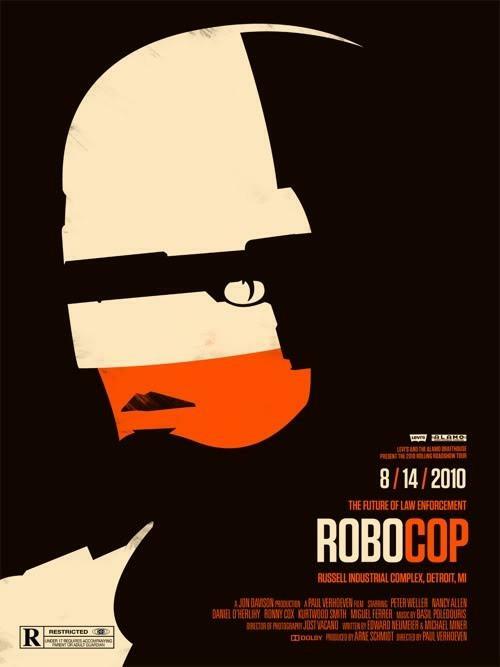 The series was the 2010 Rolling Roadshow series where films like Rocky, Dirty Harry, Jackie Brown, There Will Be Blood and Robocop all received iconic prints. Another entry from this series will appear later on, but for now we’ll look at his Robocop print. 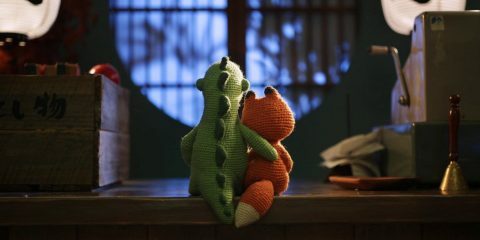 Like the other entries in this series, Moss presents an idea that runs through the themes of the film in a unique fashion. Here, the creation of RoboCop from the body and mind of once dead cop Alex Murphy is presented in as literal a manner as possible – he is a weapon created for a specific purpose, (serve the public trust, protect the innocent and uphold the law) so it is only apt that the world he sees is through a weapons eyes. 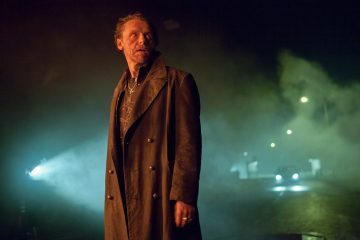 The darkness of the law has consumed Murphy, just like the corruption that has consumed the OCP who have created RoboCop. 58. When I was a kid, the work of Ray Harryhausen wowed me beyond words. Men fighting dinosaurs, skeletons and all manner of mythical beasts. It was impossible, but sure enough, Harryhausen managed to make it real through his ground breaking and era defining stop motion animation. 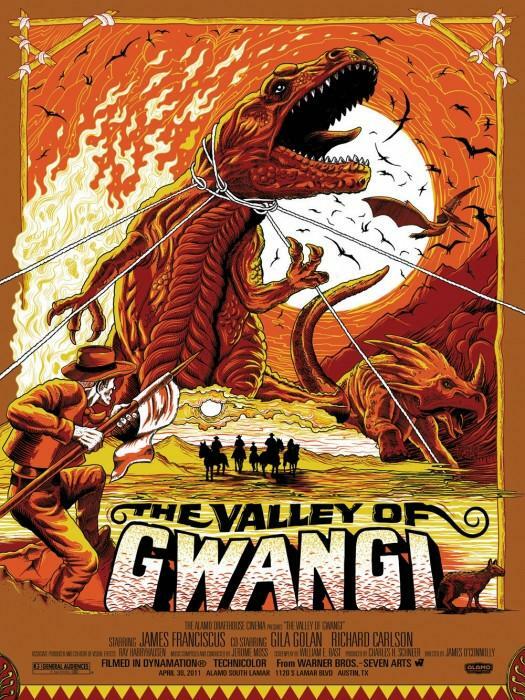 One of the iconic films was the 1969 action-western classic, The Valley of Gwangi. Cowboys versus dinosaurs. It’s like a kids toybox overflowed into a movie studio and suddenly became a film. Mike Saputo’s work here evokes an era that The Valley of Gwangi wasn’t released in. Namely, 1920’s – 1930’s action adventure films. The exaggerated Tyrannosaurus looms over the valley, caught in a trap as a fire rages behind him. Saputo shows the excitement that the film promises (and delivers) in all its raging glory. Chaos reigns, and boy is it something to behold. 57. 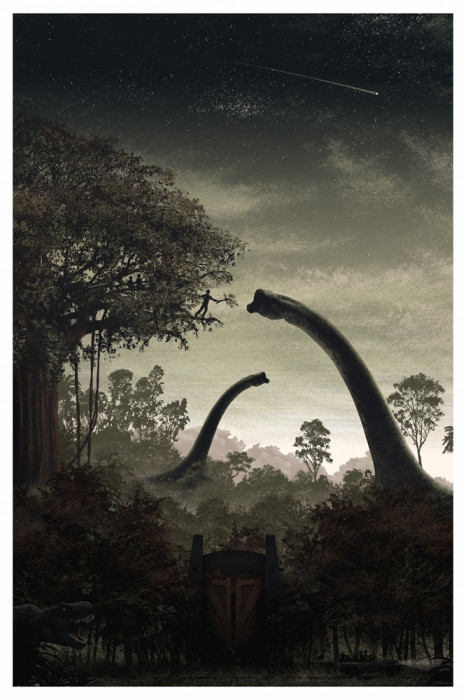 JC Richard’s work on this Jurassic Park print was, for the longest time, the must have Mondo Jurassic Park print. After the gallery show dedicated to this classic film, that is no longer the case. However, Richard’s work is one of the few to showcase the dinosaurs of John Hammond’s doomed park in a positive light. The Brachiosaurus are docile, gentle creatures who make their way throughout regions of the park with ease. Vegetarian Lex finds refuge in the chaos with a beast that doesn’t want to kill her, and Richard displays this touchingly with her silhouette reaching out to feed one of the gentle giants. 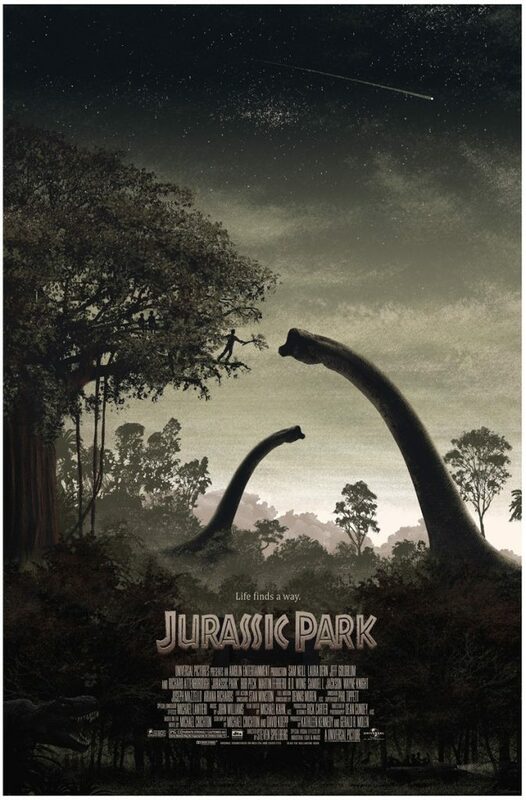 But under this quiet calm, there is chaos that rages, with the bottom of the print showcasing a moment that very well may be occurring at the same time as Lex is feeding the Brachiosaurus – the T-Rex chasing Ellie Sattler, Robert Muldoon and injured Ian Malcolm in the jeep. Richard’s print captures the wonder of Jurassic Park perfectly. 56. Alex Pardee’s gore is much like Jeff Proctor’s viscera – they both feel like they were drawn by bored school kids just whiling away the hours in class, doodling on their text books all manner of mad things. Of course, these have a lot more artistic quality than that of a school kid, but the core idea of coming up with inventive ways to showcase the blood and guts of their favourite horror films is there. Pardee’s Scream is so crazy that you can’t help wonder why someone hadn’t done it sooner. One of the most batshit crazy deaths of Scream takes place right at the opening of the film. After Drew Barrymore has been tormented over the phone, she eventually meets a gruesome fate. As her mother discovers her hanging body, the camera crash zooms on her corpse – briefly catching a glimpse of the pile of guts on the ground. 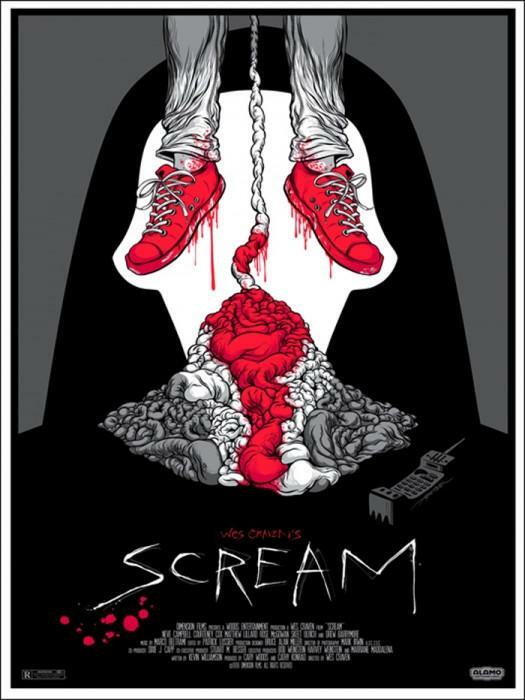 For Pardee to take that blink and you’ll miss it shot and turn it into the iconic Scream mask is genius. 55. 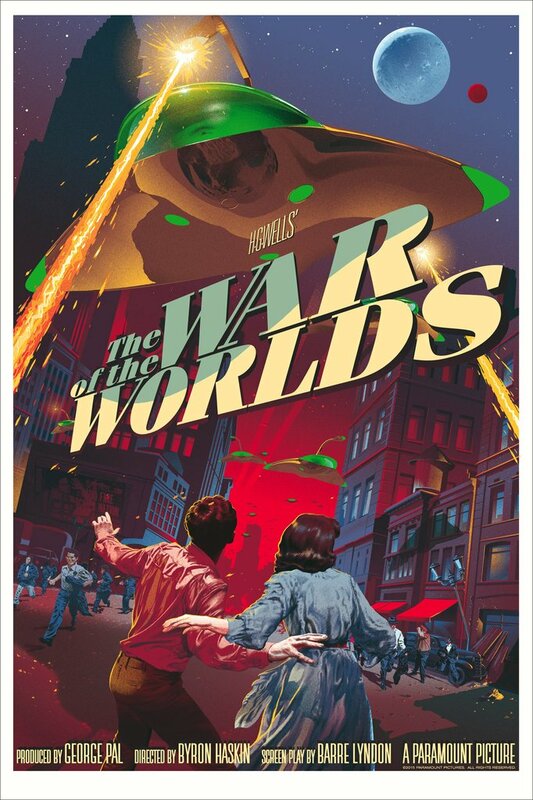 The War of the Worlds as directed by Byron Haskin is many viewers first foray into H.G. Wells’ great story. What makes Haskin’s film such a memorable one is the way he displays the tripods – which, due to limitations at the time, they were reduced to being floating saucers. The ships laser zapping eye that peers from the top of the chrome and neon green unit is a terrifying thing, and artists Stan & Vince (Stan Manoukian and Vincent Roucher) portray that perfectly. You can almost hear the ear piercing sound as the laser destroys all in its path. Stan & Vince are relatively new to the Mondo fold, and with their first release they have hit it out of the park. The colours are bright, popping off the print like a freshly cut technicolour print. The little details are what makes this print though, namely the reflection on the underside of the ship, the sly nod to the original radio show with a billboard on the side of the building (‘Radio Fake Scares Nation’), and even the individual strands of the main characters hair. Like Mike Saputo’s Pet Sematary print, this War of the Worlds print is one to lose yourself in. 54. 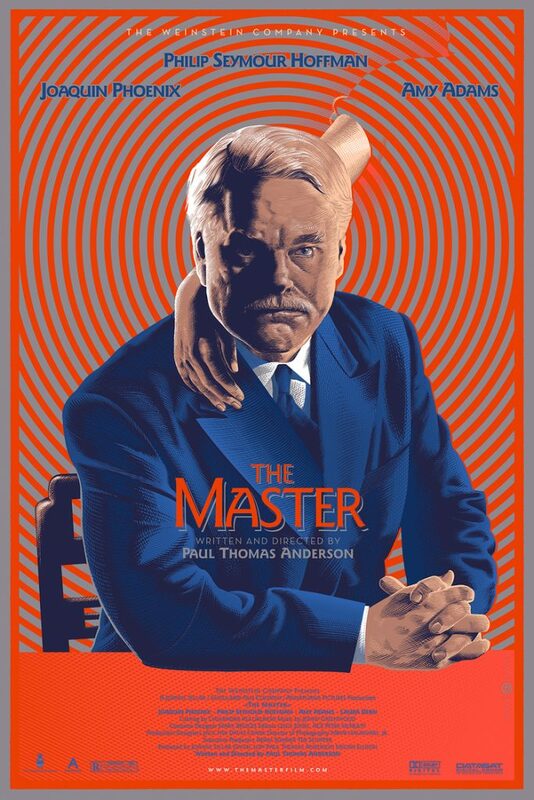 Laurent Durieux’s The Master is overwhelmingly orange. So much so that the print becomes hypnotic. Stare too long in to Philip Seymour Hoffman’s eyes and you’ll feel yourself becoming weak at the knees, your world spins, you start to lose the concept of what is real and what is unreal. You suddenly find yourself answering a series of questions without blinking. Later, you wake, finding yourself riding a motorbike into the middle of nowhere. Ok, maybe none of that happens, but it certainly is very hypnotic and very orange. Amy Adams hand just resting on Hoffman’s shoulder is most certainly creepy, raising imagery of the silent wife standing by the monumental wannabe religious figure. Durieux’s choice to use the concentric circles reminds us of sideshow hypnotists, using basic techniques to dive into the subjects mind. A perfect companion print to Jay Shaw’s 2017 Get Out work. 53. The last of the Phantom City Creative prints that are on this list is also one of the most exciting ones that they’ve ever done. Just like Alex Pardee’s Scream print, PCC’s The Burning print takes a basic idea within the film and turns it into something much more nefarious. The river of dread runs far and wide within Tony Maylam’s eighties video nasty, and PCC’s imagery leaves the necessary lump in your throat. 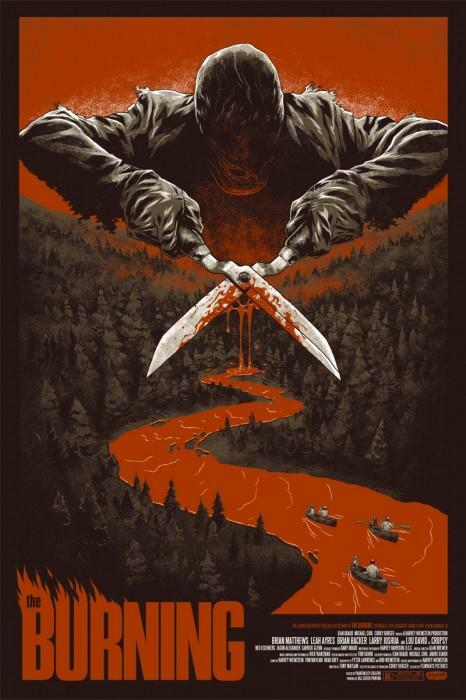 Blood and guts are a recurring motif in eighties horror films (and, of course, Mondo prints), and the concept of a faceless man tormenting a group of kids at a camp is nothing new – but with this print, The Burning is elevated above being basic genre fair. The film is great and one that’s worth seeing on the basis of this film alone – the gore promised here is delivered in spades. 52. Daniel Danger’s staple imagery is that of houses or rooms in disarray. Whether it be a house that’s collapsing, or a room full of books, there’s a key eye for detail that impresses the most. 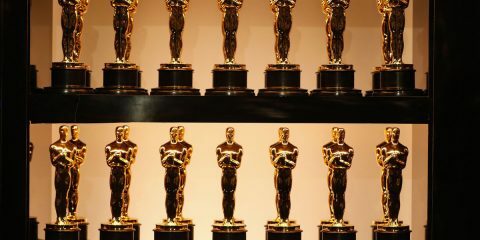 What better way to pair a room full of conflict that for the film The Royal Tenenbaums – a film that is all about a family overrun by regular familial issues. Danger’s choice to not showcase the key figure of Royal is a notable one as instead he opts to showcase a scene that embodies who the characters within the family Tenenbaum really are – real people in hiding. By contrasting a family member tucked underneath a table with images of animals, we can’t help but think of the notion that maybe all our families are (well, at least the Tenenbaum’s) are overrun zoos. 51. 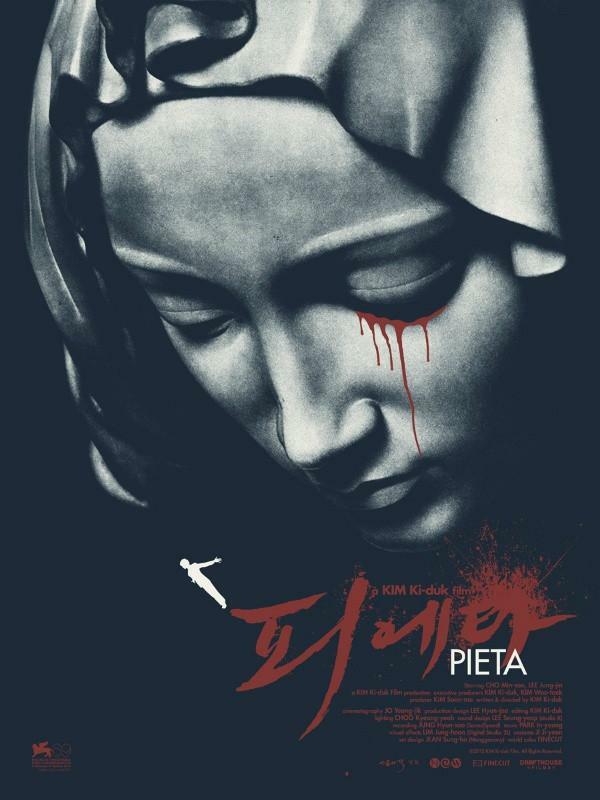 Kim Ki-Duk’s Pieta is a film that disturbs and contorts your mind. 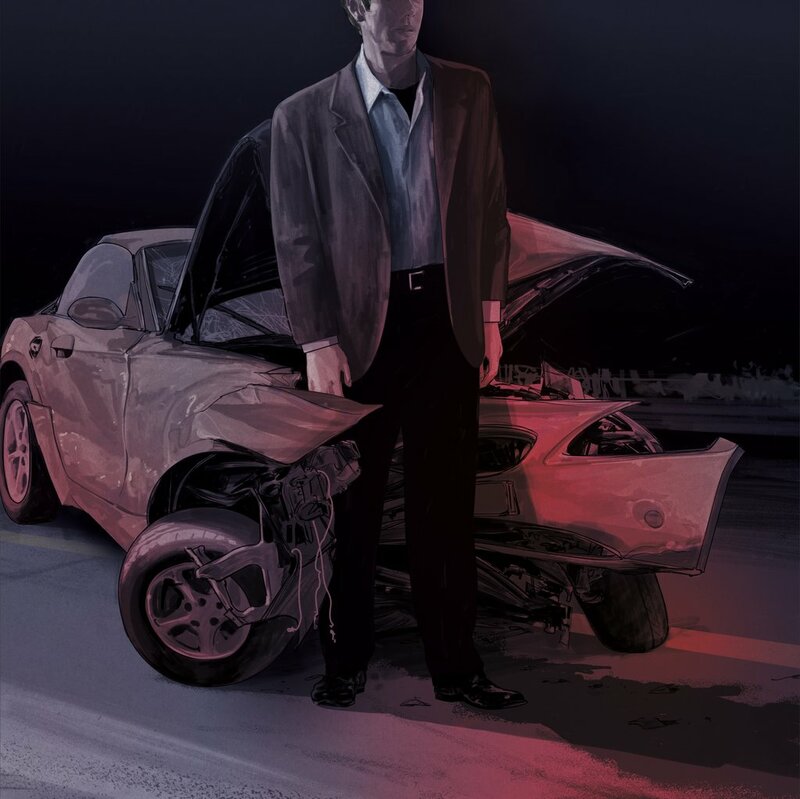 Jay Shaw is, naturally as you’ve already seen, the appropriate artist to present such a film in an artistic format. The weeping Pieta is a statue that shows Mary mourning over the dead body of Jesus, and in Kim Ki-Duk’s film, that relationship between mother and son is wrought with trauma and issues. The blood red tears paired with the swan diving figure give off an alluring ‘what if’ feeling that drives you to want to watch the film. The navy blue paper helps accentuate the difficult and complex emotions that Ki-Duk’s film explores. The fact that Mondo released a print for a Kim Ki-Duk film once again shows their desire to create works for even the smallest films. Ok, that’s it for this week! Come back Monday for the second half of this Top 100 Mondo Prints list.